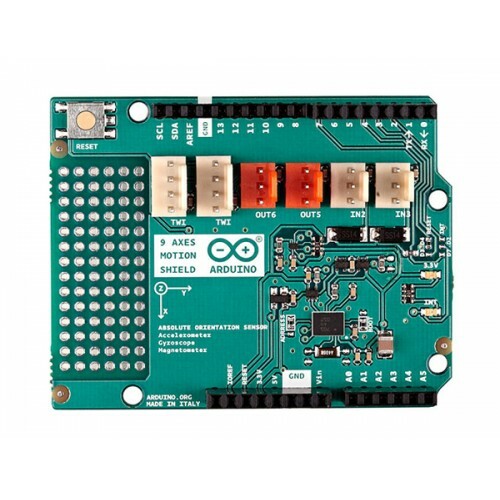 The Arduino 9 Axes Motion Shield is based on the BNO055 absolute orientation sensor from Bosch Sensortec GmbH. The BNO055 is a System in Package (SiP), integrating a triaxial 14-bit accelerometer, a triaxial 16-bit gyroscope with a range of ±2000 degrees per second, a triaxial geomagnetic sensor and a 32-bit microcontroller running the BSX3.0 FusionLib software. The sensor features three-dimensional acceleration, yaw rate and magnetic field strength data each in 3 perpendicular axes. 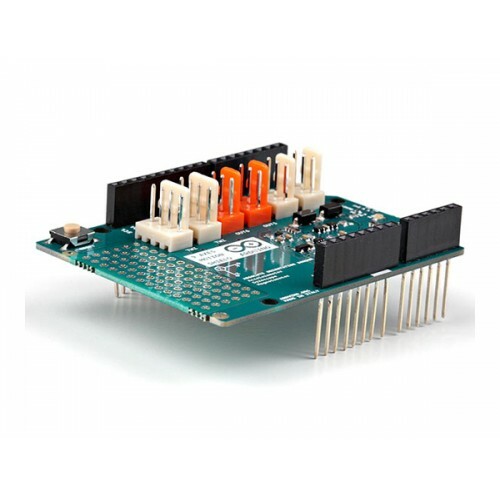 The shield is also TinkerKit compatible, which means you can quickly create projects by plugging TinkerKit modules to the board.